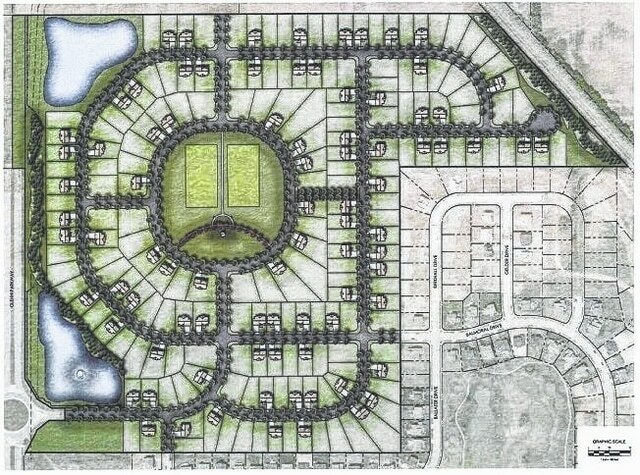 This map of the proposed Glenross North development shows the central park feature in its center. Preliminary plans for the Glenross North subdivision were unanimously approved by Delaware City Planning Commission on Wednesday after a discussion about park usage. Glenross North, just north of the golf club and east of Glenn Parkway, would consist of 196 single-family lots on about 100 acres that was annexed into the city in February from Berlin Township. The commission also approved rezoning the property from agricultural to one-family residential with planned mixed use. The homes would be one- or two-story and 1,800 to 2,000 square feet in size. The main access road would be from the parkway’s roundabout. The center of the subdivision would include a 7-acre central park with two multi-purpose fields, walking trails, a playground and a gazebo. The park would eventually be maintained by the homeowners’ association, but open to the public. Real estate attorney David Fisher asked if the central park could be limited to resident use only. Fisher also asked that a request in the staff report to install a basketball court in the central park be removed due to noise, late night use and maintenance costs. The commission agreed to have it removed. Developer Vincent Romanelli agreed to a request by member Dean Prall to have the exits of the different Glenross subdivisions clearly marked. Another 1.4-acre open space south of the main entrance would be consolidated into the city’s Glenross Park and maintained by the city. • A final development plan for Heatherton phase five, south of Benjamin Street and west of Houk Road. The subdivision, built by Pulte Homes of Ohio, would consist of 44 single-family lots on 12 acres. • A final development plan for an addition, renovation and site improvements at Smith Elementary School, 355 N. Liberty St. Delaware City Schools is proposing a 17,989 square-foot addition to the existing school, to expand it to 58,552 square feet. The addition would be for a gymnasium and school-age child care program. An existing 19-space parking lot would be eliminated, with a new 31-space lot in its place. District representative Larry Davis said the changes are possible due to the purchase of a residence at 173 W. Heffner St. The commission’s actions will next go to City Council for final approval.